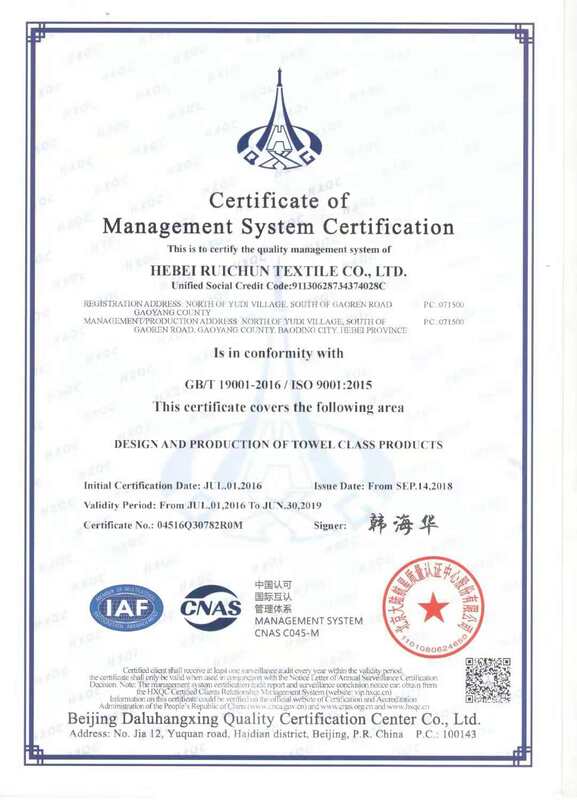 Company Overview - Hebei Ruichun Textile Co., Ltd.
Hebei Ruichun Textile Co., Ltd.
4YRSHebei Ruichun Textile Co., Ltd.
Hebei Ruichun Textile Co., Ltd. was established in 1993, which is located in middle area of Zhengyang Road, Gaoyang County, Hebei Province. 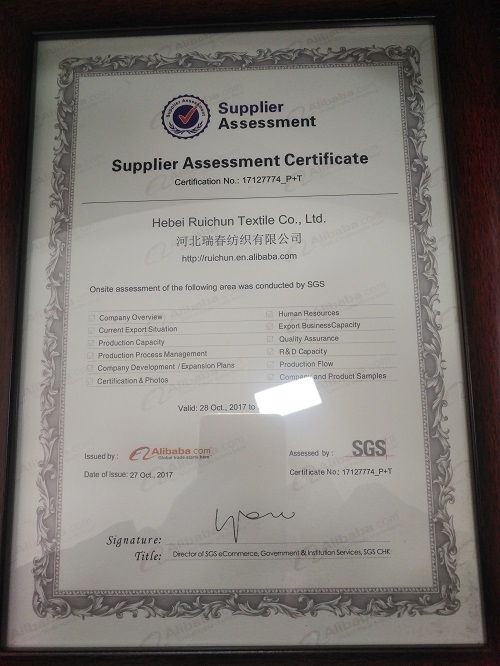 We are a professional private enterprise which manufactures a series of home textiles.Ruichun company has 500 employees, with capital of RMB110 million, advanced rapier looms 20 sets and other top grade looms more than 100 sets. 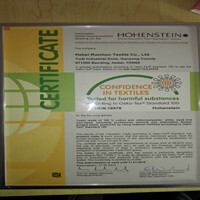 Our annual production capability of yarn is 2800 tons. 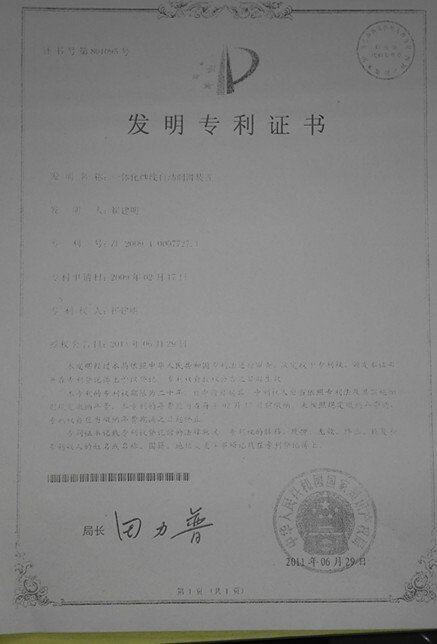 Our company has passed ISO9001:2000 quality management system Certification, and has attained the impendent right of import & export. 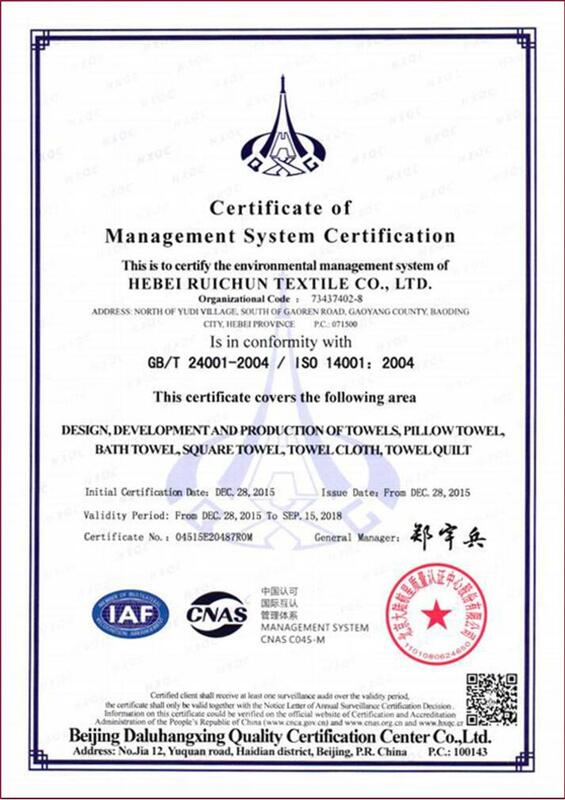 We are one of the units of China Home Textile Association, and the leading enterprise of Gaoyang County.Ruichun produces various towels, such as hand towels, bath towels, washing towels, and beach towels. 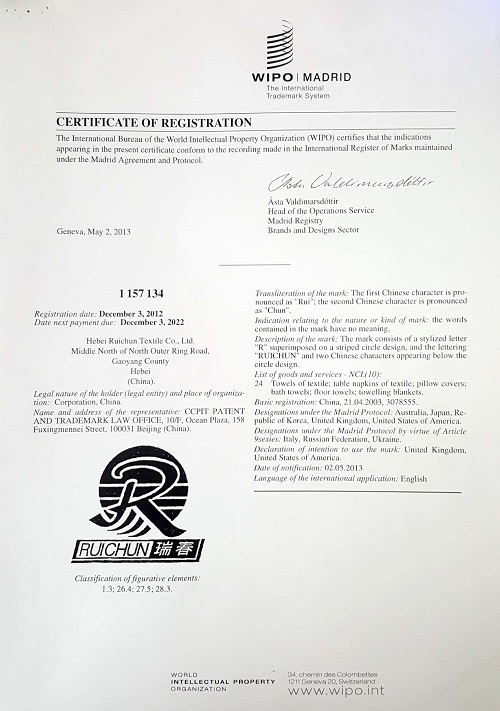 The brands "Ruichun" and "Qianmuxue" are very popular among customers and enjoy good reputation at home and abroad. 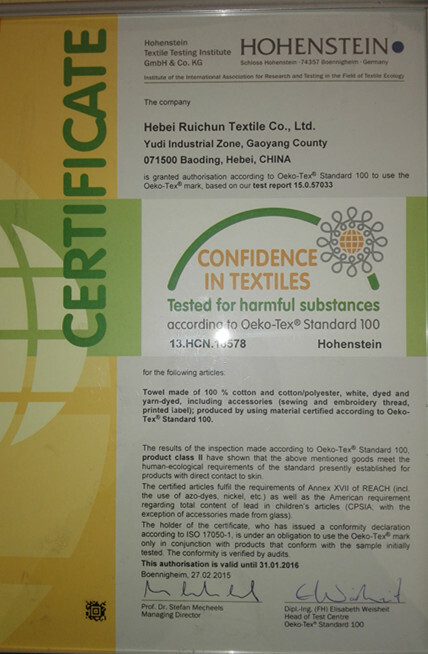 We have a powerful R&D team who has the ability to develop top grade products.The principle of Ruichun is Quality First, Credit First, and All for Customers. 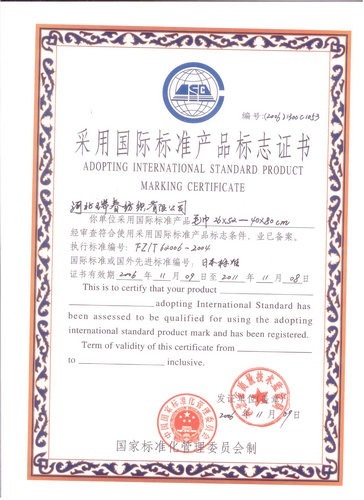 We sincerely hope to cooperate with friend from all over the world on the basis of mutual benefit and co-prosperity and create a brilliant future together.We would like to join our factory with your sales network! 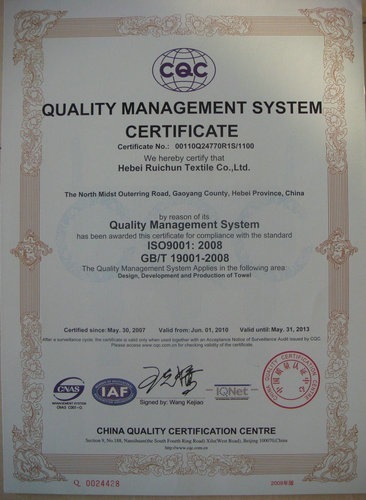 Service for producing to pure cotton towel, microfiber towel, bamboo towel, and product detect. 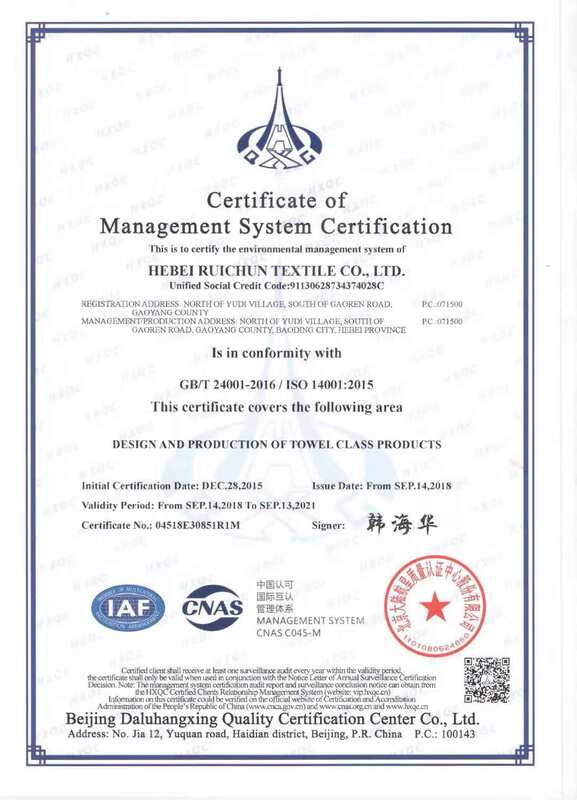 Cotton and cotton/polyester fiber towel, white, dyed and yarn-dyed, supplementary material including (sewing thread and embroidery thread, printed label). 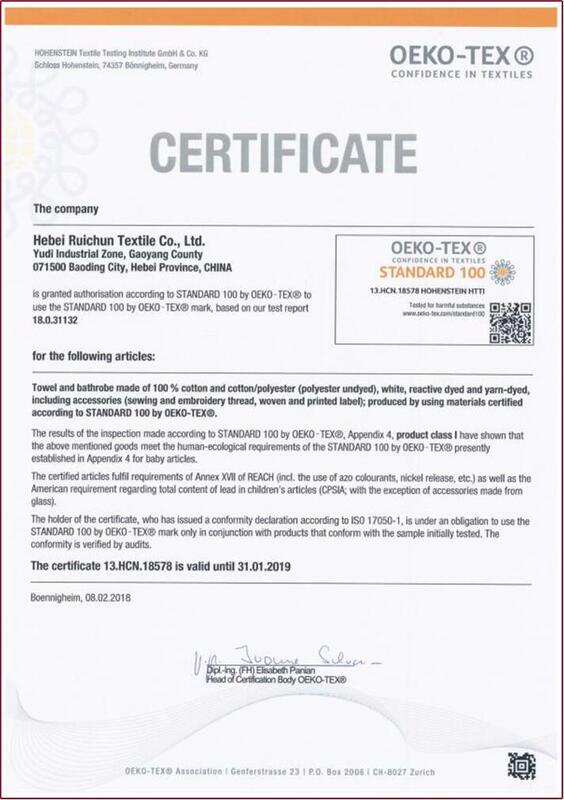 The material has been used according to the Oeko -Tex Standard - 100 Standard certification of materials.